^ a b c Walsh, D. (December 20, 1995). 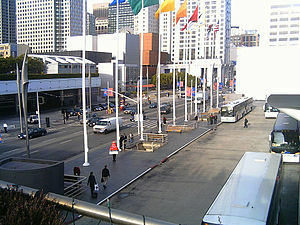 $157 million sought to expand Moscone, San Francisco Chronicle. ^ Epstein. E. (February 13, 1996). Moscone Expansion is Part of Trend, San Francisco Chronicle. ^ Levy, D. (January 19, 2003). Worries rise as Moscone expansion nears opening, San Francisco Chronicle. ^ Floor Plans, Moscone Center.